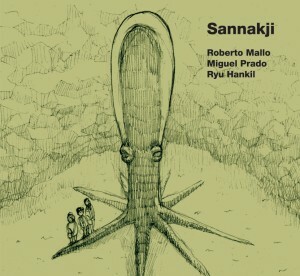 Sannakji documents the first meeting of the trio formed by Ryu Hankil, Miguel Prado and Roberto Mallo in February of 2010. In his first days in spain we recorded with Ryu two improvised pieces. His sounds of mechanical bumps were well known to us, but he did not know our way of working. Taking advantage of these circumstances, and being aware of how the result is determined by our materials, would be interesting to think about how instead of imagining three subjectivities projected with the aid of materials, think about how, objective determinations of the materials, their eigenfunctions, its immanent way to operate, was a process of de-subjectification of the peculiarities of each one of us, allowing sound to be created almost by accident between the materials themselves. Think that the result of these improvisations is not the result obtained from an improvisation; This it´s the sound of weird objects that we have not been able to completely abandon their driving, but they argue against our own self-realization of individual artists. You can order the records directly from this site, if you’re PayPal user. Please just click “Buy Now” button on each record in catalog. Postage to all over the world is included in indicated price. Also you can order through distributors soon.